QR codes. They are very useful in marketing and very helpful for businesses. But they can be a double- edged sword too. You certainly need to be very careful in using QR codes for your marketing or else you will undoubtedly turn off your customers. 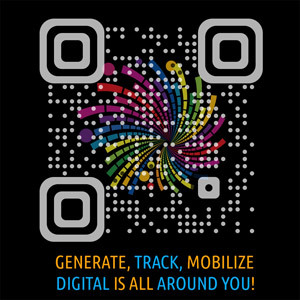 AzonMobile has been providing you with several best practices in using QR codes for your marketing. You need to have great content to put behind your QR code. You should also spell out the benefits that people would get from scanning your QR code. Plus, you need to put instructions with your QR codes so that people would know what they are and what to do with them. Not really. With the rise of new technologies, there is one more thing that you should do when you use QR codes for your marketing: provide alternatives for your customers. If you think that QR codes would solve all your problems as far as getting all the information you want to your customers, you are wrong. In fact, if you limit yourself to using only QR codes with your marketing materials, you are likely to miss out on a big percentage of your customers. Why? Because not everyone knows what a QR code is. Furthermore, not everyone who knows what QR codes are will be “motivated” to scan it. When we say provide alternatives, what do we mean? 1. Consider using a near-field communication smart tag together with your QR codes. NFC smart tags basically function similarly to QR codes. This relatively new technology allows people to use their smartphones to give people online content. However, unlike a QR code, users would need to have an NFC-enabled mobile device that they will tap against your tag. Once they tap, they will be able to access whatever content was behind the NFC tags. Why does NFC matter? It is because it is an emerging technology that is increasingly seeing support from big companies such as Google, AT&T, banks, handset makers and other big companies. It is the go-to technology when it comes to mobile payments. Every day, more and more handset makers are coming up with NFC-enabled smartphones. QR codes and NFC are not competing technologies and you should not see it as a forced choice wherein you either use NFC or QR codes and never both. You could corner a bigger part of your market if you start using both. 2. Put the URL along with the QR code. If you are directing people to a mobile Web site with your QR code, then put the same URL near the QR code. This way, people who do not have smartphones or do not want or cannot scan your QR code will still have an idea of where to go to get more information. You could also direct them to your Facebook page or Twitter account, instead of your Web site. This way, they would be able to get information from you on social media. So, you see, making sure that your customers have alternatives for your QR codes is a great thing. For one, you will get to capture a bigger portion of your market. Your marketing materials would work more effectively. You will not lose interested customers just because they have an old outdated feature phone.